What happens when the practical also has a poetic side? In recent months, visitors to the National Gallery of Canada have had a chance to explore the answer to this question. A series of small exhibitions of historical photographs, drawn from Library and Archives Canada’s collection, considers the aesthetic, as well as the documentary properties of images created “on-the-job” by 19th-century surveyors, public servants and engineers. 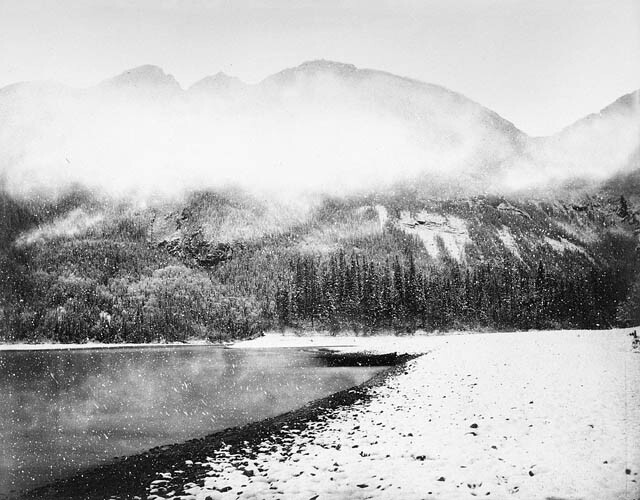 At first glance, this beautiful photograph, which was part of the past exhibition Early Exploration Photographs in Canada, seem to be exactly as labelled — a view of the Peace River in British Columbia, as it appeared during a snowstorm in October 1872. It turns out, however, that Charles Horetzky, official photographer with Sir Sandford Fleming’s Canadian Pacific Railway survey team, deliberately enhanced its dramatic effect: paint splatters were added to the image in order to create the effect of non-existent snow. The current exhibition, Paul-Émile Miot: Early Photographs of Newfoundland, on view until February 2, 2014, includes this portrait from the 1800s, by French naval officer Paul-Émile Miot. It was taken while surveying and mapping the coastal areas of Newfoundland — at the time, France maintained a commercial fishing interest in these waters. 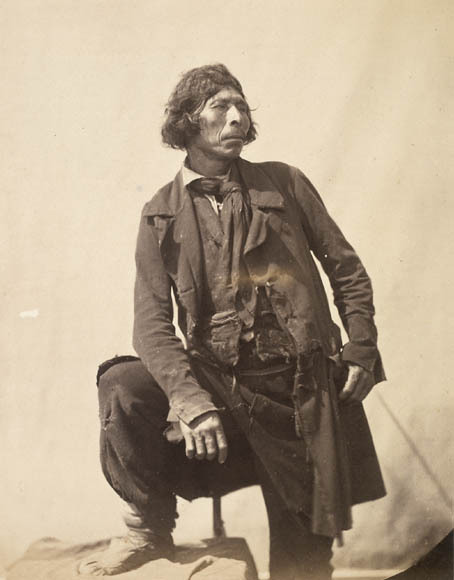 Though Miot was capturing the earliest known photographs of members of the Mi’kmaq Nation, the extravagant pose of his subject suggests 19th-century European romanticism. So-called inaccuracies or created effects in 19th-century documentary photographs do not negate the worth of these images as records of past events. If anything, they add fascinating nuances of meaning to these items, as artifacts. We invite you to stay tuned for the next exhibition, on Arctic exploration photography, opening on February 7, 2014. This entry was posted in Art, Our Collection and Facilities, Photography and tagged Aboriginal, Charles Horetzky, Exhibitions, National Gallery of Canada, Paul Émile Miot, photographs by Library and Archives Canada Blog. Bookmark the permalink. Why are these exhibitions being shown at the National Gallery and not at the Library and Archives Canada building on Wellington Street? The main floor of the building was designed to host exhibitions and should be used to showcase LAC holdings. I have heard that there may soon be an exhibit in the lobby at 395 Wellington. If this is the case please let us know about it. Perhaps something to commemorate the 100th Anniversary of the First World War might be appropriate.